In 1997, when Ogi Akira, new manager of the Kobe-based Orix Blue Wave Pacific League team, changed the name on the No. 51 shirt from Suzuki to the player's first name Ichiro, the modest outfielder was somewhat embarassed. But it was a fitting tribute to a player who many regard as the best Japanese baseball has ever seen. He also shares several records, including that of being Pacific League MVP three years running (1994-96). In his nine seasons in Japan, he was a career .353 batter and his best season was his last - in 2000 he batted .387 (just short of the Japanese record of .389 held by Randy Bass since 1985). But rather than stay on course to inevitably become the Greatest Ever in the NPB, in 2001 Ichiro decided to cross the Pacific for a whole new level of challenges. Born on Dec 24 1972, Suzuki Ichiro first picked up a baseball bat when he was 3 years old and developed a real interest in the game when he was 8. He took part twice in the National High School Baseball Tournament at Koshien Stadium. After graduation, he was drafted by the Blue Wave but spent the first two seasons in and out of the first team under manager Doi Shozo. Doi didn't like Suzuki's independent spirit and 'pendulum' style of batting but his true talent was recognized by Ogi. And how that talent blossomed! The 1994 season was a spectacular one for Suzuki. He became the first Japanese player to get 200 hits in a season and with several other records broken his first MVP award was a given the end of the year. From that season on, he became one of the most popular and respected players in Japan. But unlike some players who have failed to live up to their hype, he was amazingly consistent - after 1994, he never relinquished his PL batting crown, had less than 200 hits or batted below .340 for a season. His 1997 streak of 216 at-bats without being struck out showed just how hard it is to get the guy out. For a player with the highest salary in the game (530 million yen in 2000) and nothing more to prove, the only way up in Japan was to move to the more high-profile Central League or become the first Japanese batter to break .400. Instead, he was widely expected to make use of his free-agent status after the 2001 season and make the jump to the Major Leagues. Having had a taste of the Seattle Mariners' spring training camp in 1999, it seemed he had his sights set on the Pacific Northwest. But knowing they were going to lose him the next season anyway, Orix 'posted' Ichiro, making him available to all 30 ML teams under a sealed bid system. Seattle paid more than $13 million to negotiate with the player, who signed a 3-year contract for an undisclosed sum. 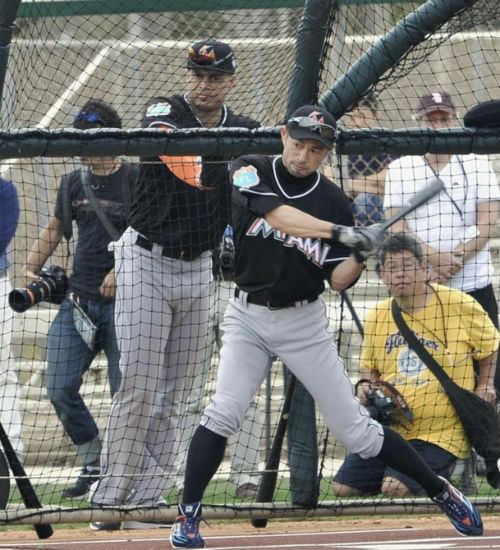 "It has been my dream to play in the major leagues," Ichiro said. "When I took part in the Mariners camp in 1999, I felt like a rookie, almost like a little kid. I knew then I wanted to play in the majors and experience the challenge of competing against the best players in the world as soon as I possibly could." He made an impressive start to his ML career - both at the plate and in right field. He recorded two hits in his first game and with fellow countryman Sasaki Kazuhiro as impressive a closer as he was in his 'rookie' season, this pair of 'samurai' Mariners made a dream start. Ichiro has also shown why he was even given a brief stint as a pitcher in Japan, with his lightning-fast and deadly-accurate throws from right field. In the 2004 season, he won over new legions of fans with the grace and poise with which he broke George Sisler's 84-year old record for single-season hits. He ended up with 262 hits for the season and no one else looks close to matching that for a while - except Ichiro himself. Meanwhile, expectations of the first .400 season for generations rested squarely on his small shoulders. Small as Ichiro is (178cms, 80kg), he was to play a big part in the Big Leagues (read an interesting Japan Times article about 'The Throw' that had the MLB buzzing in 2001). 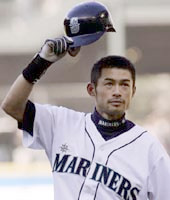 Ichiro also faced the fearsome Randy Johnson as the first AL batter in the 2001 All Star game and managed to get a hit. His biggest frustration must have been playing on a team that, despite having such a fearsome leadoff man, under-performed for the many seasons he stuck it out in Seattle. The arrival of fellow countryman and star catcher Jojima Kenji in 2006 was no doubt a bonus but the team still couldn't become a contender. That frustration was surely relieved somewhat by his performance at the inaugural World Baseball Classic in the spring of 2006. Beaten twice in earlier games by the team from South Korea, Japan faced their Asian rivals again in the final. Ichiro's inspired hitting and leadership led his team to a victory that had the whole country buzzing. Baseball fans saw, perhaps for the first time, an Ichiro almost overcome with excitement and emotion. The Japan team managed to even defend the title in 2009, and it came as little surprise that it was once again Ichiro who came through with the clutch hit in the final. No doubt the stress of that WBC win was a major cause of the bleeding ulcer that kept Ichiro out of the Seattle lineup for several games at the start of the 2009 season. But even an injury later in the season couldn't stop him from breaking one of the oldest records in baseball. On September 14, he got his 200th hit of the season, managing the feat for a record 9th consecutive year and breaking the record held by Wee Willie Keeler since 1908. Needless to say, he extended that record the following season. But, now in his late 30s, it was perhaps only to be expected that the streak would come to an end, which it did in the 2011 season. In the middle of the 2012 season, with Ichiro's salary being seen as something of a burden on a constantly struggling Mariners franchise, he was traded to the New York Yankees. He immediately went on a tear, putting up impressive numbers for the rest of the year. In December 2012, at the age of 40, he signed a $13 million deal for two years with the Yankees. In August 2013 Ichiro became just the third player ever to reach 4,000 hits in professional baseball (the others being Pete Rose and Ty Cobb). And no doubt Ichiro is man enough not to worry about the asterisk next to that number because the first 1,278 of those hits were not in the Majors. At the age of 42, Ichiro still sets his sights on new milestones. In April 2015, and now with the Florida Marlins, Ichiro broke Oh Sadaharu's record for runs by a Japanese player. Scoring on a teammate's homer, the run gave Ichiro a total of 1,968 - 1,310 in the major leagues and 658 in Japan. No doubt, even at the age of 41, he has his sights set on the next milestone of 2,000 runs. But even the MLB total alone puts him in Hall of Fame company. One of the few questions remaining about Ichiro is whether he will be inducted into the Japanese or the US Hall of Fame, or become the first ever player to make it into both. In response to a reader's question regarding whether Ichiro uses Nike bats, we checked and the answer is no. Like several top players including his compatriot Matsui Hideki, he favors the Mizuno Pro Maple MZP51 bat, designed by Mizuno's master craftsman Kubota Isokazu.